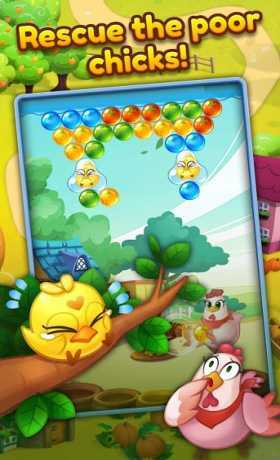 Pop your way to save CoCo’s chicks in this bubble shooting adventure! CoCo wakes up one night to find her chicks nowhere to be found! But the culprit can be none other than the devious Mr. Fox! Help CoCo rescue her chicks and teach the sneaky fox a lesson! With a slingshot in hand, guide bubbles to bring CoCo’s babies back to safety! 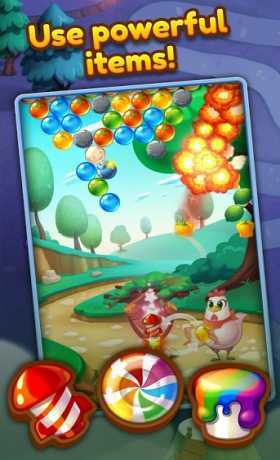 Shoot through bubbles in hundreds of levels to save the chicks, squish spiders, and beat the fox! But watch out, as Mr. Fox has set up numerous traps like the slime bubble to keep you from reaching your goal! 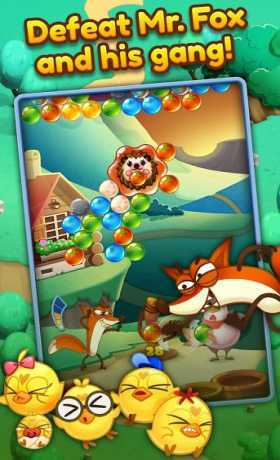 Mr. Fox is no match for you with the various items and boosters available in Bubble CoCo! Send him flying with items such as the Rocket, or give him a good shock with boosters such as the Lightning Bubble! Explore the beautiful world with CoCo as she sets out on a quest to teach the fox a thing or two about messing with her chicks! Play with friends simply by logging into Facebook or connecting to Google Play Games! REWARDS YOU WON’T WANT TO MISS! Enjoy more features and special treats in Bubble CoCo by logging into Facebook! Bubble CoCo can be played without an internet connect, so you can play your favorite game on your phone or tablet whenever you want, wherever you want!